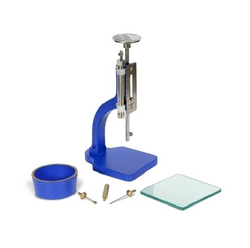 This instrument is used for determining the time setting of hydraulic cement. A base with a vertical shaft and two horizontal arms. The lower arm is Adjustable for height. 1 No. Initial needle 1/12 inch dia1l4lb.wt. 1 No. Final Needle 1/12 inch diameter 1 lb. wt. 1 No. Glass base plate. A base with a vertical shaft and two horizontal arms. The lower arm is adjustable for height. 1 No.. Initial Needle 1/12 inch dia 1/4 lb.wt. 1No.Final Needle 1/12 inch dia. 1lb.wt. 1 No. Glass base plate. Complete as above. This instrument is used for determining the time setting of hydraulic cement. Accurate in working, these VICAT Apparatus are offered in the market in damage free packing. In addition to this, these presented units are small in size and made of rust proof components. This product is damage free in nature and remains sustained up to longer years without any maintenance. Same as above but in addition is fitted with a dash pot which facilitates gentle lowering of the needles. Used in Construction Lab for Checking Liquid limit.